Used to upload maps to my Garmin. Product became too hot to touch then shut down. Not much use! Very pleased with this. Quick delivery too. Space grey matches laptop perfectly. It does the job and it matches the colour of my MacBook perfectly. Gets dirty easily though and sags down slightly when in the laptop. Other than that it's great. Very useful dock, makes the Mac Air usable with a dock and other USB devices. Good, if a little loose. Overall the adapter is functionally good, with nice looks, a good range of ports and fast upload time. If there is one drawback it is that does not fit as tightly as I would have liked to the side of the laptop. Does exactly what I need it to. Perfect. It's easy to use and does what it says on the box. Much cheaper than other options. The item arrived swiftly just in time before Uni started off, it's light and compact and easy to use. It goes nicely with my laptop and almost blends in as if its a part of it. A necessity for my MacBook Pro as I found it to be one of the best USB-C adaptors on the market. The pass through charging is also a great feature that comes to use in the best of times. However it is a little costly which for a student isn't so good but apart from that I cant't fault it. Not that impressed unfortunately. Doesn't seem to stay in the port / laptop keeps popping out which is super annoying. Even worse when you have something other than one port full. Dissapointed. We bought this to use with ad memory sticks and it does what it is for. My thoughts on this are that the USB-c socket could do with being slightly longer to accommodate the protective case we have on our MacBook,as it is we have to jiggle it to make connections with the MacBook . The other thing I would say is that the socket is having to support the whole weight of everything that's plugged into it and I wonder if it's designed to stand this usage. I feel that if there was some form of supportive mechanism at the other end of the hub that could either clip into or clamp onto the device it's connected to then this might help to support the USB connector. Feels a little bit delicate at times but over all, it's good value for money. Would recommend. I purchased this device to enable me use existing items with my new MacBook Pro - very pleased with it - but it threw me that my camera SD card wouldn't fit, then realised it goes in upside down. I bought this item on the 212 of June. for the past weeks it has been giving me problems and its not working. the usb c adapter blue light turns on but the USB ports are not. please can this be resolved? Sorry to hear you are having problems. Can you please contact our Customer Services team so we can look into this for you. For the price I am really satisfied of the quality of this gadget. If you look what the Apple Store offer when you need SD cards and USB adapter and the price, this little adapter is genius, the only thing is that its really sensitive so ... be kind with it. I would love it more if it would be related to the computer by a cable maybe.... anyways. Overall Good pricing, fast shipping! Product took expected amount of time to arrive. The adapter is a little hard to put into the laptop, but I'm sure it should wear in over time. The adapter doesn't sit flush to the laptop, so it makes it difficult to plu things in. Excellent with new Mac book . This is must when purchasing new Mac pro .compact and stylish. Does it's job! and very convenient! The light helps as well, to see if it is plugged in and working. when plugging the item into my MacBook Pro, it lights up, and when plugging my disc drive into the port, the disc drives makes a noise as if it recognises that something has been plugged in. But the disc drive will not accept any discs and a message appears saying "usb accessory needs power, connect apple usb superdrive to a USB port on this Mac" very disappointed with this as I need this for my work as I need too install photoshop onto my Macbook for my career as a photographer. Sorry to hear you are not happy with this accessory. The MacBook may not be able to provide enough power to the accessory if you have other power hungry things plugged in to. Ensure you are connected to mains power in this instance, which should hopefully help. If you have any more problems, please let us know. Great little USB-C dock with dual USB ports and SD slots. Can't provide enough power from a MacBook 12 (2015) to run 2 external HDD's which is kinda annoying, however it still will run them with the power supply plugged into it, so now this is a dock that I can actually backup my external Lightroom catalogue to another external HDD with. FINALLY!!! Not to sure if I got a faulty one but it can't can't read cards if I have a USB cable plugged in. Also drops in and out of connection. A little disappointing considering the price. Can you please try inserting a power cable into the adapter when attempting this, it may just need more power than the laptop itself can provide. One of the better adaptors out there, nice and sleek, matches my MacBook perfectly. Only downside is the micro SD card slot is a little finicky, it's easy to put the card in and miss the exact docking spot and the card will slide all the way into the adaptor. I honestly don't know what I'd do without this usb hub!! I honestly don't know what I'd do without this usb hub!! The new MacBook Pro's don't have any charging ports aside from its own charger and this usb hub has all the necessary ports! Its small and lightweight. Really sleek and subtle and matches my laptop. I take it to University along with my laptop. It's a life saver. I'm tempted to buy another one as a back up! This product is amazing, for such a cheap price compared to other websites this has been the best price and delivery was super fast. This has helped me so much recently as it provided usb ports and sd card slots which my mac does not provide. very well built and fits comfortably on my laptop. Hope this review helps you. For me this is a great product for the new MacBook Pro. I like the way it sits flush against the MacBook rather than having a cable linking it. All the USB ports and memory card slots work well and it is so simple to use. I had to wait a while for it to be back in stock but it is well worth the wait. Good value for money too. I would highly recommend this product. 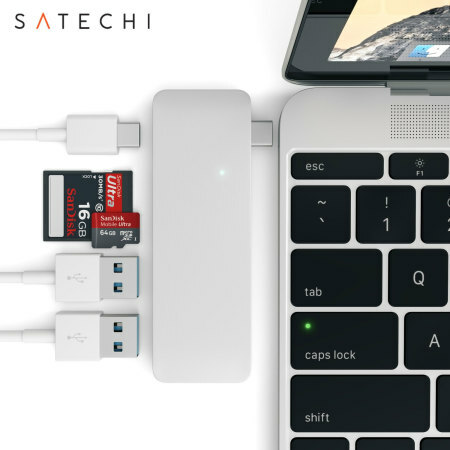 I purchased the Sathechi USB-C hub Space grey for my macbook pro with touch bar space grey because I love the form factor and the design itself. The design is clean and neat and somehow blends with the macbook pro compared to those wired dongles. It comes with micro sd, sd card slot, 2x usb 3.0 which is very essential since apple decided to remove it in the new macbook pro. To sum it all, this product is very good and highly reccomendable..